Since v3.0, CCBoot makes you be able to run batch commands automatically on client booting, just read below. 1) Please click "Options" button on the toolbar of CCBoot server. 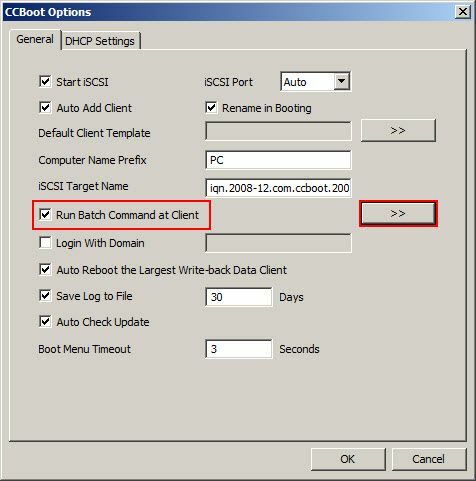 2) Click "General" tab, select the"Run Batch Command at Client" check box. And click the">>" button. 5) -Skip update - means this command will not run when the client is super client. On CCBoot server, there’s a folder named "Cmd" in CCBoot install directory. 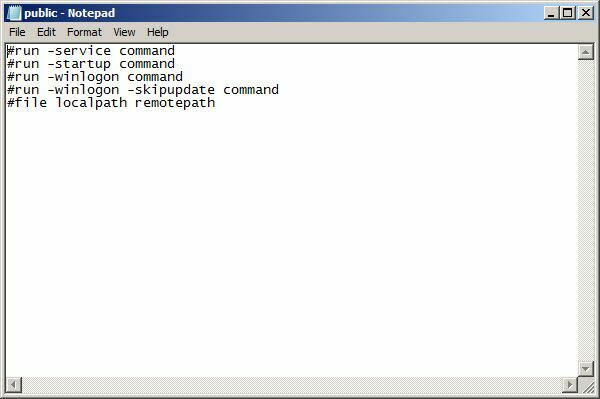 You can create batch commands files here in order that clients can implement this file when booting. If the file is named"public.txt", all clients will implement it. If the file is named by specified IP address such as "192.168.1.101.txt", only the specified client (192.168.1.101) will automatically implement it. The above usages also apply for ip.txt. Attention: If there are two files - "192.168.1.101.txt" and "public.txt", the client (192.168.1.101) will implement "192.168.1.101.txt" and"public.txt". The "192.168.1.101.txt" runs before"public.txt". The reg files should be saved in the image by super client.Commands are run at client, so the files in the parameters of the command should be in the local client first. And you should also disable client UAC by super client. 1. Login to GGLeap in admin mode. 2. Add startup command for the client then save.